Today marks the official release of ON1 Photo RAW 2019.2. What's this, I hear you ask? Well, it's the latest free update to ON1 Photo RAW 2019, and features some performance enhancements and new camera support. 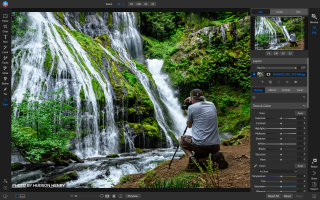 ON1 Photo RAW 2019.2 is marketed as an alternative to Lightroom and Photoshop (but there's no monthly subscription). According to its makers, "It puts the primary photo editing needs for photographers under one roof without having to bounce between multiple pieces of software." As well as the usual editing parameters you'd expect, there are also hundreds of fast, non-destructive, stackable, re-editable, and customisable photo effects and filters within the software, designed to provide an endless amount of results. Despite the software name, it's not just for raw files. Supported formats also include JPEG, TIF, PSD, PSB, PNG, and DNG. The most exciting update comes for Nikon photographers, thanks to the added tethered shooting support for the Nikon Z 6, Z 7 and D850. There's also added support for the Leica D-Lux 7 and Panasonic DMC-TZ101. Powered by machine learning, a new AI Quick Masktool creates high-quality masks using a few strokes as guidance while understanding colour, tone and textures to create a detailed mask in a fraction of the time. Lastly, the video card is now able to speed up common processes like returning to Browse, and copy/pasting layers and masks. Canon EF 100-400mm f/4.5-5.6L IS II USM, Chinon 75-205mm f/3.8, KMZ Industar-50-2 3.5/50, KMZ Jupiter-37AM MC 3.5/135, Nikon AI-S Nikkor 105mm f/2.5, Olympus M.Zuiko Digital ED 17mm f/1.2 Pro, Olympus M.Zuiko Digital ED 25mm f/1.2 Pro, Olympus M.Zuiko Digital ED 45mm f/1.2 Pro, Pentax-FA 28-70mm f/4 AL, SLR Magic 8mm f/4, SIGMA 16mm F1.4 DC DN | C 017, SIGMA 30mm f/1.4 DC DN | C 016, Tamron SP 35mm f/1.8 Di VC USD F012, Tamron SP 70-200mm F/2.8 Di VC USD G2. Unlike the Creative Cloud subscription, you can buy a one-off purchase of ON1.